So you’ve had your mates round to watch the soccer and one of them in their exuberance jumped up to celebrate a goal only to send several bottles of beer spilling out over your lounge carpet. Occurrences like this aren’t uncommon and it’s easy for accidents to happen in the heat of the moment when a person gets carried away with excitement. So how do you go about removing a beer stain from your carpet? The thing with beer stains is that it’s not just about removing the stain from a carpet but also about removing the smell which can hang around in the air for weeks if not treated and leave your lounge smelling a little like a brewery. So with that in mind how do you remove the stain AND the smell? Whether you’ve spilled beer on the carpet or the couch, the clean up method is still the same. As this is a large spill then you need to mop up as much of the liquid as you can. Use a few beach towels to do this and then put them straight in the washer. Leaving the towels laying around is another reason why the smell can linger in the air for some while. Beer is one of those stains which isn’t immediately apparent like red wine or tomato sauce for instance. So once it’s been mopped up with a beach towel by someone and there’s no visible stain, it’s easy to forget all about it and get back to watching the game. That is until next day when you notice that the stain, and the smell is still there. To prevent this you need to make up a mixture of one tablespoon of white vinegar and 2/3 of a cup of rubbing alcohol and use a paper towel to dab it on the carpet or couch until the stain (if there is one) and/or the smell has disappeared. Keep blotting the stain until all the mixture has been used. If you haven’t got any rubbing alcohol then you can use clear dishwasher liquid instead. You probably don’t want to be doing this in the middle of the game but it’s important to treat the stain while it is fresh and to take your time blotting it with the paper, otherwise it will be harder to remove the next day. Sponge the area thoroughly using cool water to make sure there are no traces of vinegar or rubbing alcohol/dishwasher liquid left in the carpet. Leave the carpet to dry naturally. You can also use this method of stain/smell removal for red wine spills although the best treatment is to dab the stain with a mixture of white wine and table salt. The white wine will serve to neutralize the redness of the wine and the salt will make it easier to vacuum that area of carpet. Of course, if all else fails, then call in the professionals and we’ll soon have your carpet looking as good as new. 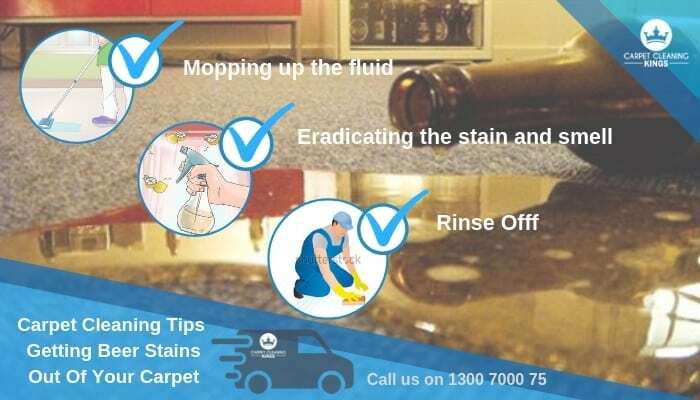 Give Carpet Cleaning Kings a call on 1 300 7000 75.